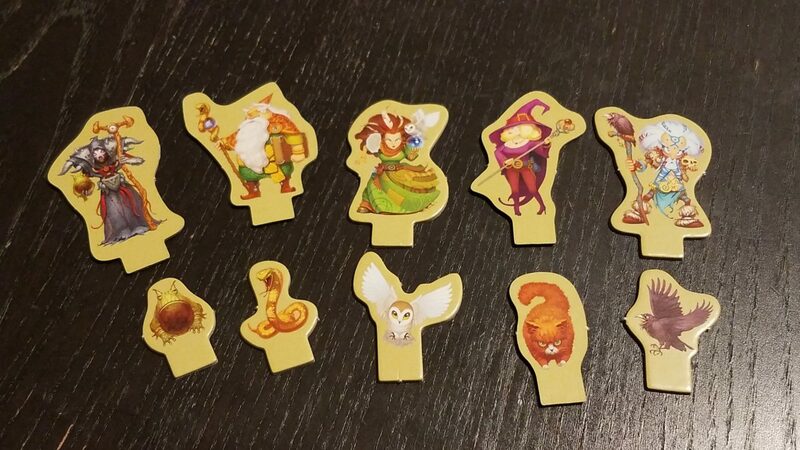 Five Seals of Magic is a dice rolling luckfest with nice presentation and an impressive variety of gameplay options...which fails to overcome it's random-driven core and the mismatch between time invested and gameplay experienced. In Five Seals of Magic, each player is on a quest to unlock the most potent magical spells by making their way through the Arcana Tower and just bashing the living heck out of the five magical seals who live there. 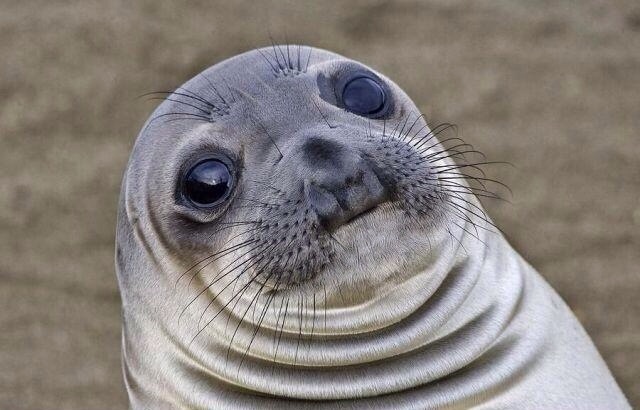 Andrew: …wait, I got confused about which kind of seals we’re destroying, again, didn’t I. The Arcana Tower, before the fiddly setup process. Gameosity received a copy of Five Seals of Magic for review. We weren’t otherwise compensated. Ok, so besides the whole waterborne mammalian violence, my initial description of Five Seals of Magic still stands. You and your fellow players will race through the tower, using dice to bypass seals in order to reach more and more powerful spells. And as you gather up those spells, you’ll be using them to further manipulate dice, letting you advance faster and further through the tower with each move. Seals come in 5 colors, corresponding to the dice used to break them (except for the purple seals, those can be broken by any dice). At the beginning of each round, players can choose which color dice they will use for that round, which will partly determine which seals you’ll be able to break and which paths you can take on your turn. I say ‘partly’ because, as you can imagine, the roll of the dice has everything to do with how much progress you’ll be able to make on your turn. Seals can only be broken by a die (or combination of dice) which meet or exceed their value (2-6), so a *lot* of your possible actions hinge on how lucky you are with your round-starting role. And I say ‘a lot’ (and not ‘all’) because the spells that you start with (and acquire) during your trip through the Arcana Tower are there to help you manipulate your dice and mitigate the randomness. Through judicious use of your spells, you can turn a mediocre roll into a more productive turn. Jess: Of course, it’s still dice, so it’s totally possible to get yourself into a situation where you can’t make much progress no matter what spells you throw around. Though the more spells you get, the less likely that is to happen. Andrew: And there’s also the other players to consider – blocking is a big part of the strategy in Five Seals of Magic, since players generally can’t move through each other (or through each other’s companion familiars). So even when you roll perfectly, there will be times when another player has smartly put themselves directly in your way, tanking your planned actions. Five Seals of Magic is, at its heart, a race. Players scramble across the board, smashing seals as they go, hurrying to acquire the most valuable spells by the end of the game (determined by how many value 6 spells are left on the board). Ultimately, it’s the player who manages to roll well, manipulate their dice efficiently, and block their opponents effectively who will win the day. The Circle of Might is the most basic set, consisting of spells that let you add and manipulate dice. 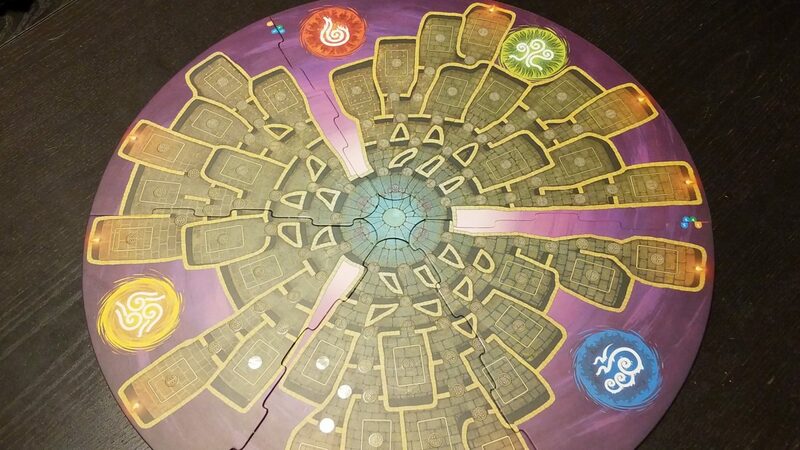 The Circle of Spaces focuses on manipulating the game board by moving spells and seals around. The Circle of Movement is all about (you guessed it) moving around the board and preventing your opponents from doing the same. Jess: I think it’s really cool that there is such a variety of spell types in the game! It let’s you customize your experience a bit, since you can focus toward or away from aggressive interaction, etc. Andrew: Absolutely. 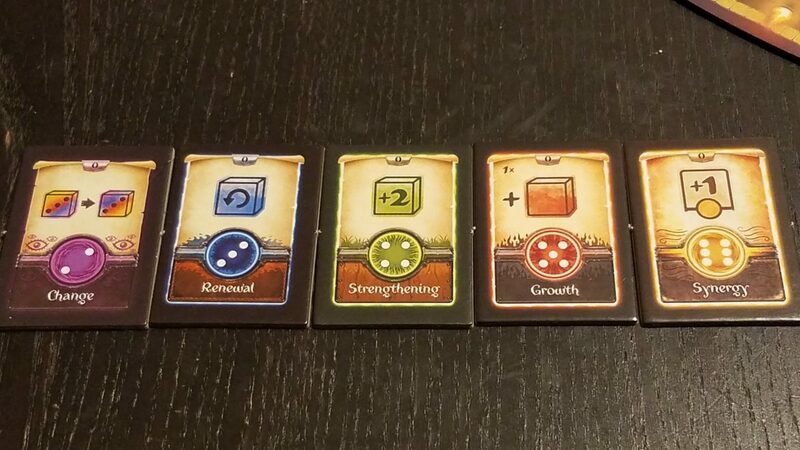 The variety of scrolls is one of Five Seals of Magic’s strengths, and it will add a bit of depth and replay value to what is otherwise a really luck-driven game. And here’s where we come, absolutely necessarily, to talking about luck. The honest truth is that in Five Seals of Magic, it is most likely the player who rolls the dice they need who will win every time. 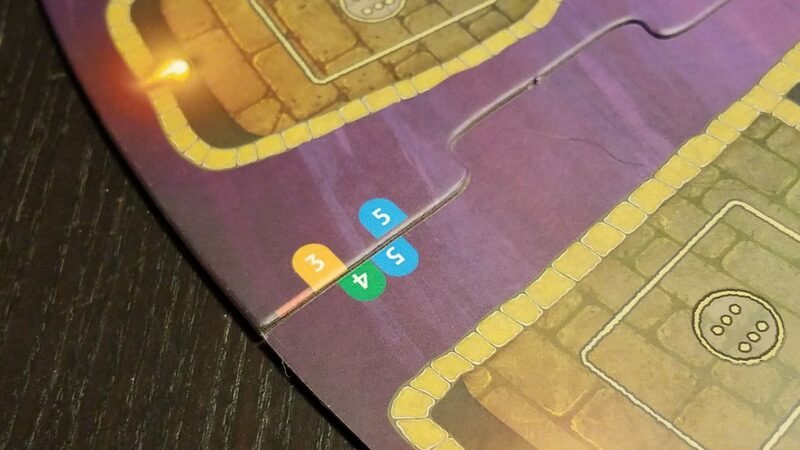 In all games that feature dice manipulation and random chance, this is of course an absurdly obvious statement, but in Five Seals of Magic, it is entirely possible for a player to breeze through seals and turns, while another struggles to get the wheels turning, just because of how the dice have fallen. And while Five Seals of Magic is absolutely about manipulating dice as a central mechanic (especially if you eschew the gameplay variance of Circles beyond the Circle of Might), there will inevitably be times, especially early in the game before players start gathering spells, when you will roll your dice and realize you’re not doing anything productive that round. Andrew: This has two effects on gameplay. Firstly, it means that the rich get richer – a player who rolls lucky will get spells before a player who doesn’t, and will therefor have more options for how to mitigate crappy rolls in the future. For players who lag behind for no reason other than the luck of the roll, this can be really frustrating. Jess: And the other thing all this luck does is robs you of a sense of agency. When I roll what I need, great, I blast through some seals and maybe snag a spell. But whether I’ve been lucky or the opposite, in neither case do I feel like I’m really doing anything. Five Seals of Magic isn’t really a game of skill at all, and there are times when that can leave you feeling really unsatisfied. Andrew: But that would be totally fine for a quick-playing dice-chucking filler. 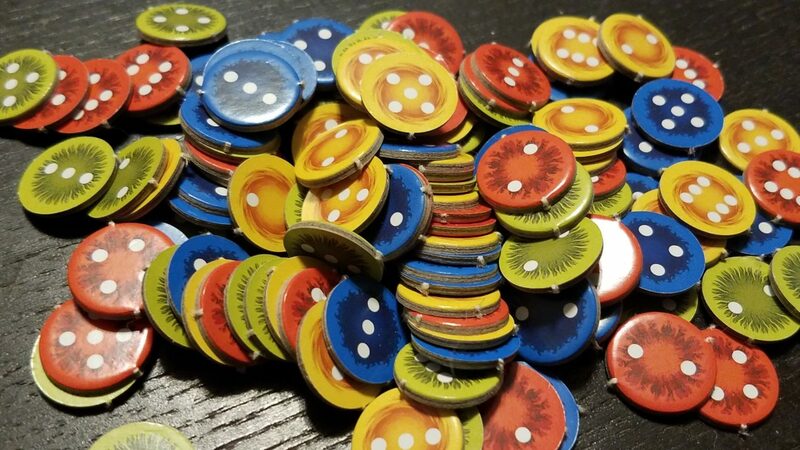 We absolutely accept, and even embrace, that very randomness when we laud a game like Dairyman or World Championship Russian Roulette, or heck, even Martian Dice. Because those games are fast to set up, learn, play, and tear down, so there’s little investment beyond the fun of the game itself, and the randomness doesn’t really hurt the experience – frequently improving it, actually. And if Five Seals of Magic was a filler, then it would be absolutely fine!…but the problem is that it’s a filler that has setup times and learning curves associated with heavier (though not heavy) games. All the little seals must be distributed across the board. All the iconography must be learned, and each time you decide to play with a new spell circle, you’ll be re-learning them. And while the presentation is truly gorgeous and the table presence is fantastic, at the end of the day what we are dealing with in Five Seals of Magic is a game that has a bit of a mismatch between the gameplay experience and the investment of time in getting it set up and played. Andrew: Now, whether a game is ‘worth it’ is an incredibly personal assessment, and certainly not something that can be dictated in absolute or measurable terms. But for me, personally, Five Seals of Magic isn’t. Not because Five Seals of Magic is bad, but because I can get the same core gameplay experience in several other dice drafting/manipulation games that are either faster or have more interesting decisions or are easier to get to the table. Jess: Yeah. It’s not that Five Seals of Magic really does anything wrong, but it doesn’t do enough that’s new or interesting to really make it stand out as an option when it’s up against games that do what it does just as well or better. It’s also a highly contentious game when played aggressively, and you need to play aggressively since it’s a race, and so between all the blocking and all the luck, there were just too many times that I felt like I couldn’t really do what I was there to do. Ultimately, Five Seals of Magic was a miss for us, which is a shame because it’s a really attractive, perfectly playable game with great production and nice scaling for the number of players. While we appreciated the potential for variety that the different Circles offered, the truth is it’s unlikely that it would hit the table with the sort of frequency where that would really end up being a boon. 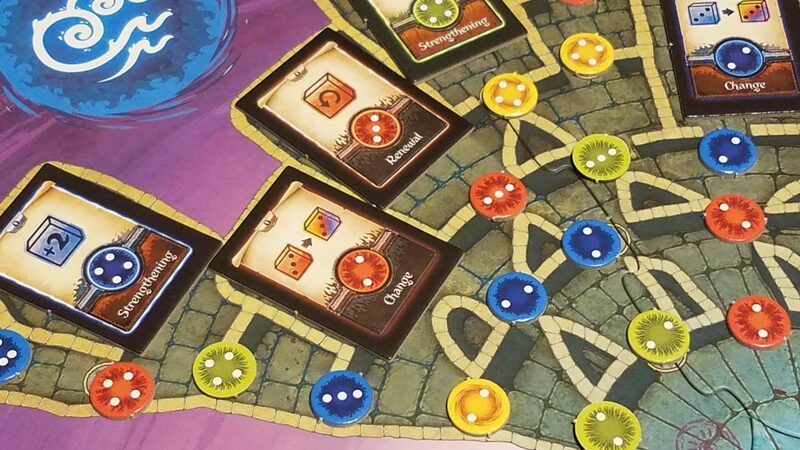 But that’s just our opinion – if you’re in the market for a big, luck-driven game or dice manipulation, then you could check out Five Seals of Magic for yourself. 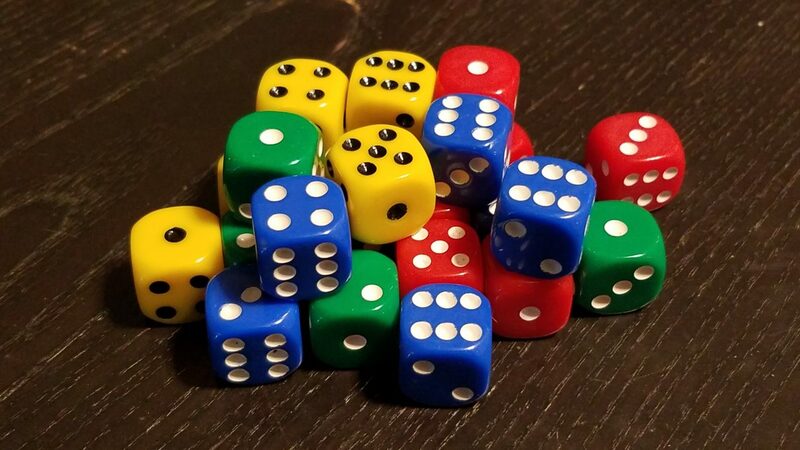 And here are some other options for dice-focused games of varying weights and experiences that we think work really well.